When it comes to cutting up cake, it can be quite the game of risk--some slices might be too big, you may not have enough to go around, or worse, you'll end up with kids fighting if the slices are not equal. Fortunately, LEGO is here to save the day! 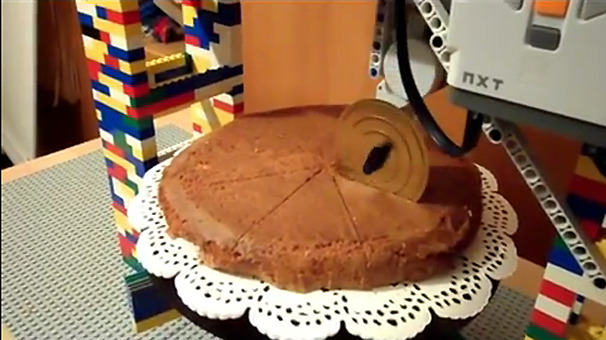 Bart and Stef from Belgium created the Mindstorms Cake Cutter, specifically for breaking up slice disputes. After building a LEGO tower, with space for a rotary platform and a "blade mover" on top, a Mindstorm NXT processor, two touch sensors and three motors were wired up to the object. The knife attached to the blade mover as made out of the lid of a tin can (so watch your fingers if you try to make this). To get a cake cut, simply key into the processor how many slices are needed, place the cake onto the rotary platform and wait for your perfect slices. The sensors allow the platform to turn the cake after each slice has been completed, and the blade mover means the knife can glide from one side of the cake to the other.